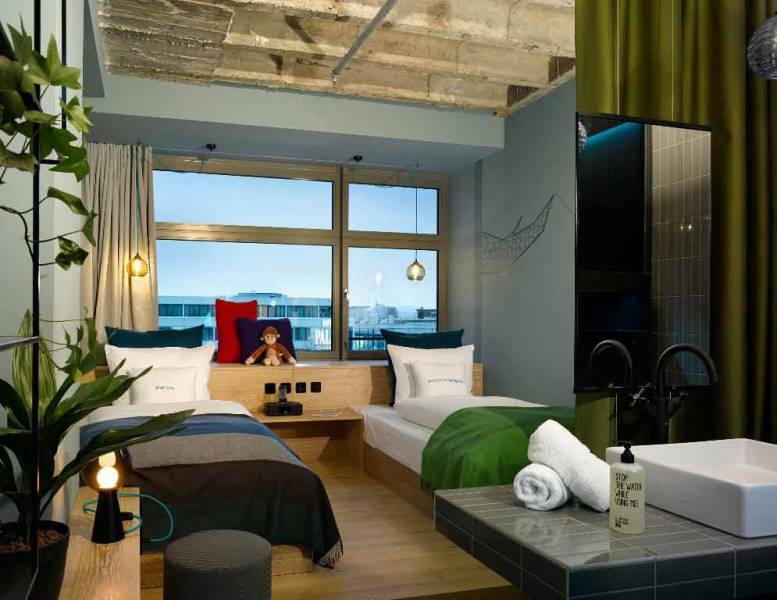 Next time you go to Berlin, do yourself a favor and visit THE 25 hours Hotel Bikini Berlin – its real eye candy for an interior design enthusiast! 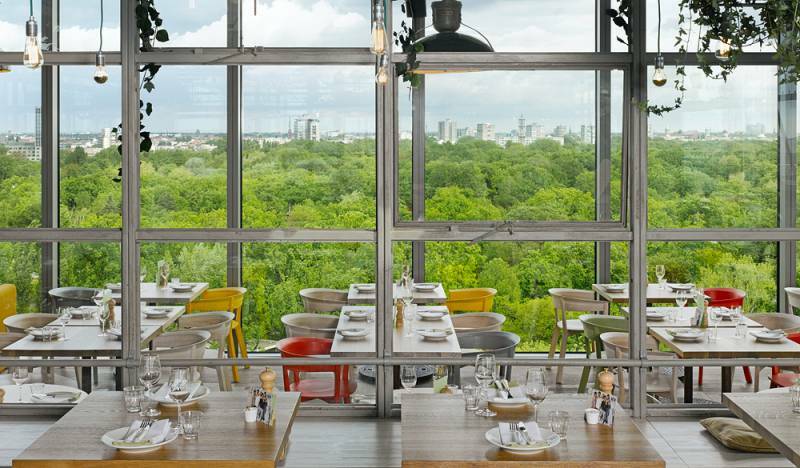 And besides, you can enjoy a fab meal or a drink in the restaurant and bar on the top floor with a 360° rooftop terrace and a stunning view of the city. I want not only to recommend you to pay this site a visit but also to show you how small details make the entire difference – I really love the details made in these rooms! Here it comes… who wouldn’t enjoy an ice cold drink with this view!! STUNNING! Næste gang du kommer til Berlin, så gør dig selv en tjeneste og besøg ´The 25 Hours Hotel Bikini Berlin´ – det er virkelig en fryd for øjet for en indretnings-entusiast! Og udover lækkerier for øjet, kan du nyde lækker mad eller en drink i restauranten og baren på taget med en 360 ° terrasse og en fantastisk udsigt over byen! Udover at anbefale jer at smutte forbi, hvis i en dag kommer til Berlin, vil jeg også vise jer, hvordan detaljer gør hele forskellen – også eller måske især, når det kommer til indretning – jeg er vild med detaljerne på Bikini Hotellet! If you are into the industrial kind of living and you ever get the chance to go to Germany – give yourself a stay at DasPark Hotel! 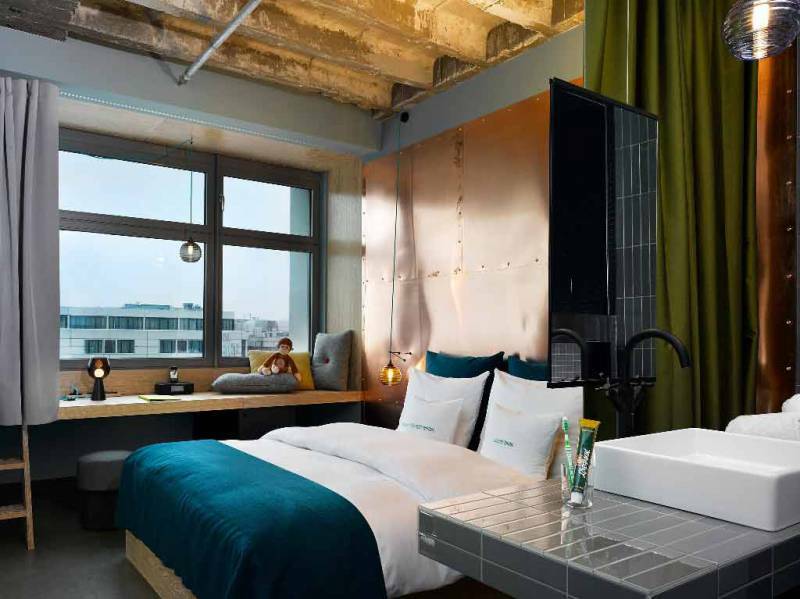 This hotel is simply too cool, imagine staying in a concrete sewer pipe – Does it get more industrial, I don’t think so 😉 Each pipe comes equipped with a double bed, a small storage space, and a desk-side lamplight, you even get a cotton sleeping bag! All other hotelery devices are supplied by the surrounding public space. This is a fabulous opportunity, a unique way of minimalistic traveling. Andreas Strauss, the man behind this creative project, has not only taken creative accommodation to a higher level (if you ask me), he has also created an experience for (almost) everybody with his pay-as-you-wish system, a system where customers leave a Euro amount that they can afford and with which they wish to support our project! Reservations can be made at www.dasparkhotel.net/reservation at any time. I imagine being on the road, just travel the world around and around, stop whenever I want, go wherever I wish, live in such a small space where I am only able to have the most precious and important stuff with me – when it comes down to interior design it makes me feel a kind of relief, cause I can’t redecorate a trailer every day (hmm I can, but then I won’t have time to enjoy it before its changed again!). Because I am so passionate about decorating and changing the look of my surroundings I never relax, my eyes, my thoughts every tiny little sense of my body is alert! I think a trailer would be my place to relax and still a tiny place to decorate in a crazy way! The sad truth is that I don’t have a trailer, but in my search I felt over this hotel Daniel in Vienna!! THE DANIEL TRAILER! If you ever go to Vienna check this out – it looks so cool and the interior fits perfectly to the trailer though A DANIELLE TRAILER for sure would look complete different I think this one is really classy! BUT THIS ONE THAT CROSSED MY WAY IN BERLIN IS STILL MY FAVORITE!! SHOW ME YOUR TRAILER AND EXPLAIN WHAT IT ADDS TO YOUR LIFE IN ONE WORD! #3 GET INSPIRED BY THE WORLD WIDE ACE!! READY FOR TAKE OFF!!!! THIRD DESTINATION IS PORTLAND! Today Ill give you a tour at the third ACE-Hotel – this time we are in Portland, and I have to admit this must (until now) be my favorite! The hotel is placed in Portland downtown and i must say – I have never been there, but I got to go! Though the ceilings aren’t decorated ( 😉 ) these rooms are simply thought through to perfection, loads of artwork, loads of atmosphere – still casual but thats the expression of ACE and I think it really works!!? Don’t you? Notice how they have exploited the space in the smaller rooms – I find it very inspiring if you have a studio! There are so many cool pics to show, so Ill let them speak for themselves this time – how do you like it?? STAY TUNED, ADD YOUR EMAIL, FOLLOW MY BLOG! #2 GET INSPIRED BY THE WORLD WIDE ACE!! Today Ill give you a tour at the ACE-Hotel in LONDON, Shoreditch, and pin out all the fab details that might inspire you in your own home-decor-projects! As in NY, ACE hotel in London offers rooms from standard to suite – again all of them decorated to minor details – if you have seen the post yesterday from New York, I find that ACE in London has a bit softer look and maybe not as much edge as you´ll find in New York! Nevertheless casual, cool and made to perfection! Again the furnitures at ACE Hotel are a mix of classic design and vintage and a mix of materials (leather, steel, textile, wood etc. ), I really like the leather couch and the wooden tables but I do miss some more HIGHLIGHTING art! The black and white wall is casual and contemporary, but if you ask me I would have chosen another plaid for the bed, more colorful! (even though the colors compliment each other – i find it a bit boring)! OR keep the plaid and make an ARTSY wall! NEXT DESTINATION IS PORTLAND,.. YOU WONT MISS IT – TRUST ME!